Glaucoma refers to a group of disorders that lead to damage to the optic nerve, the nerve that carries visual information from the eye to the brain. Open-angle (chronic) glaucoma is by far the most common type of glaucoma. The reason for treatment is to reduce eye pressure. Depending on the type of glaucoma, this is achieved with medications (eye drops) or by surgery. Some patients will need other forms of treatment, such as a laser, to help open the fluid channels. In open-angle glaucoma, the cause is essentially unknown. An increase in eye pressure pushes on the junction of the optic nerve and the retina at the back of the eye, reducing the blood supply to the optic nerve. Open-angle glaucoma tends to run in families. Your risk is higher if you have a parent or grandparent with open-angle glaucoma. People of African descent are at particularly high risk for this disease. You can manage open-angle glaucoma and almost always preserve your vision, but the condition cannot be cured. It’s important to follow up with your doctor. With good care, most patients with open-angle glaucoma will not lose vision. Acute angle-closure attack is a medical emergency. Blindness can occur in a few days if it is not treated. Drops, pills, and sometimes medicine given through a vein (by IV) are used to lower pressure. Some people also need an emergency operation, called an iridectomy. This procedure uses a laser to open a new channel in the iris. The new channel relieves pressure and prevents another attack Early diagnosis and treatment is important. If surgery is done early enough, many patients will have no future problems. Angle-closure (acute) glaucoma occurs when the exit of the aqueous humor fluid is suddenly blocked. This causes a quick, severe, and painful rise in the pressure within the eye. Angle-closure glaucoma is an emergency. This is very different from open-angle glaucoma, which painlessly and slowly damages vision. If you have had acute glaucoma in one eye, you are at risk for an attack in the second eye, and Dr. Garrett is likely to recommend preventive treatment. Dilating eye drops and certain systemic medications may trigger an acute glaucoma attack if you are at risk. An examination of the eye may be used to diagnose glaucoma. 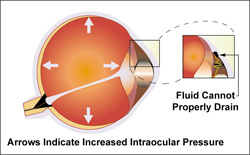 However, checking the intraocular pressure alone is not enough because eye pressure changes. The doctor will need to examine the inside of the eye by looking through the pupil, often while the pupil is dilated. Tests may include: Visual field measurements, gonioscopy (special lens to see angle channels), retinal exams, optic nerve imaging (OCT), pressure tests, dilation and more, depending on your circumstance. If non- surgical methods fail to decrease pressure, surgery may be required to create a new drainage channel. Filtration surgeries are designed to relieve eye pressure by removing tissue, inserting implants in the eye, or a combination of both. SLT LASER – Garrett Eye is one of the few practices with the advanced SLT Laser technology. (Selective laser trabeculoplasty) therapy uses a special laser to reduce the pressure in the eye. It is painless, ultra-safe, and the treatment only takes a few minutes. The treatment is covered by essentially all insurances and is less than the cost of a year of eyedrop therapy for both the patient and the insurance company. Dr. Garrett will numb your eye with an eye drop. Then, a special laser will be applied to the front of the eye. The laser energy stimulates the body’s natural healing, and enhances the outflow of the fluid from the eye, which lowers pressure. The SLT procedure can effectively lower pressure, and the treatment can be safely repeated if the glaucoma continues to worsen as you age. SLT is used primarily for Open Angle Glaucoma. LASER PI – An iridectomy involves surgically removing a small piece of the iris that will allow for a better flow of fluid in eyes with Narrow Angle Glaucoma. TRABECULECTOMY- Trabeculectomy is the most common surgical non-laser procedure performed for glaucoma when the IOP is no longer controlled by eye drops, pills or laser treatment. A trabeculectomy creates a “controlled” leak of fluid (aqueous humor) from the eye, and a small bubble is formed to produce a valve for proper flow of fluid. Dr. Garrett uses a modern technique with Mitomycin C and a releasable suture to further improve the chance of success. Call Garrett Eye at 800-428-8149 if you have severe eye pain or a sudden loss of vision, especially loss of peripheral vision, or if you have risk factors for glaucoma and have not been screened for the condition.